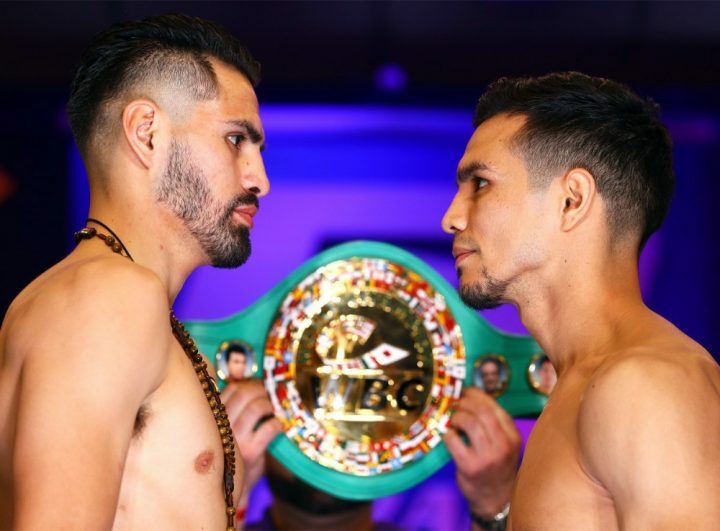 By Allan Fox: Unbeaten WBC light welterweight champion Jose Carlos Ramirez (23-0, 16 KOs) weighed in at 138.6 pounds on Saturday for his title defense this Sunday, February 10 against #14 WBC fringe contender Jose Zepeda (30-1, 25 KOs) at the Save Mart Center in Fresno, California. Zepeda, 29, weighed in right at the light welterweight limit at 140 lbs. On his first weigh-in attempt, Zepeda came in at 140.2 lbs, which was too heavy. On the second weigh-in attempt, Zepeda hit it right at the limit at 140 lbs. This will be the 26-year-old Ramirez’s second defense of his World Boxing Council 140 lb title that he won last March in defeating Amir Imam. Ramirez defeated Antonio Orozco by a 12 round unanimous decision last September in his first defense of his WBC 140 lb title. Ramirez is a heavy favorite to defeat Zepeda, who is coming into the fight with a seven-fight winning streak. Zepeda’s only career defeat was to Tony Flanagan in July 2015 in a 2nd round injury stoppage loss. Zepeda suffered a shoulder injury in the fight and needed to bow put. Flanagan had talked of wanting to give Zepeda a rematch, but he never did so. At 26, Ramirez is a major talent. He just needs to face better opposition so that he can start building his name. It’s possible that Ramirez could move up in weight to go after WBO welterweight champion Terence Crawford in the near future. That’s a fight that Ramirez wants, and it would be an easy one to put together due to both of them being signed with Top Rank Boxing. Former WBO lightweight champion Raymundo Beltran (35-8-1, 21 KOs) weighed in at 139 lbs for his 10 round fight against Hiroki Okada (19-0, 13 KOs). For his part, Okada weighed in at 139.6 lbs. Beltran and Okada will be fighting for the vacant WBC Continental Americas and WBO Intercontinental light welterweight titles. This is going to be a tough one for the 37-yer-old Beltran, who is coming into the fight having lost his last match to Jose Pedraza by a 12 round unanimous decision last August. Beltran lost his World Boxing Organization lightweight title in that fight. There were some boxing fans who felt that felt that Beltran should retire after his loss to Pedraza, but he chose to stick it out. Matchroom Boxing USA promoter Eddie Hearn says he’d like to put together a rematch between Beltran and former three division world champion Ricky Burns if he’s interested. However, with Beltran signed with Top Rank, it’s unlikely that he’ll take the rematch with Burns, as it’s a fight that would likely be streamed on DAZN or at least that’s what Hearn would be hoping.